Lightel investigates the connection between the effects of circadian adjusted LED light and health care for senior citizens. With the collection of health data and knowledge of the reception of the new technology, we can promote the uptake of energy efficient technologies in eldercare. The trial participants will be assessed at baseline and after 4, 8, 12 and 16 weeks, respectively. The test panel will consist of questionnaires, functional and cognitive tests, and a blood sample for detecting underlying causes of delirium and illnesses during the trial. The interview guide will be built on Spradley’s ethnographic interview, for the method’s ability to gain in-depth information about perceived reality from the participant’s point of view. The semi-structured interview format allows comparisons between participants and allows hypothesis testing, and is at the same time flexible. The observation will be semi-structured with a moderate degree of participation which will allow informal talks with the participants. The observation will look into the behaviour of the participants, and look at changes in their rhythms, routes and routines, with a special emphasis on daytime drowsiness, and how they interact with the light in the space. By using this framework, a holistic evidence combining quantitative and qualitative data analysis can be defined and support the use of circadian adjusted LED lighting for housing facilities for the elderly. The project has been implemented by the municipality of Albertslund, Aalborg University, Hvidovre Hospital, Chromaviso and Gate 21. The municipality of Albertslund is lead partner. Aalborg University is responsible for the collection and analysis of qualitative social antropological data as well as quantitative data from light sensors and the analysis of the energy consumption data, and Hvidovre Hospital is responsible for the clinical data. Chromaviso is the supplier of the applied circadian lighting and the clinical validated light protocol, adjusted lighting design, technical health care products and implementation. 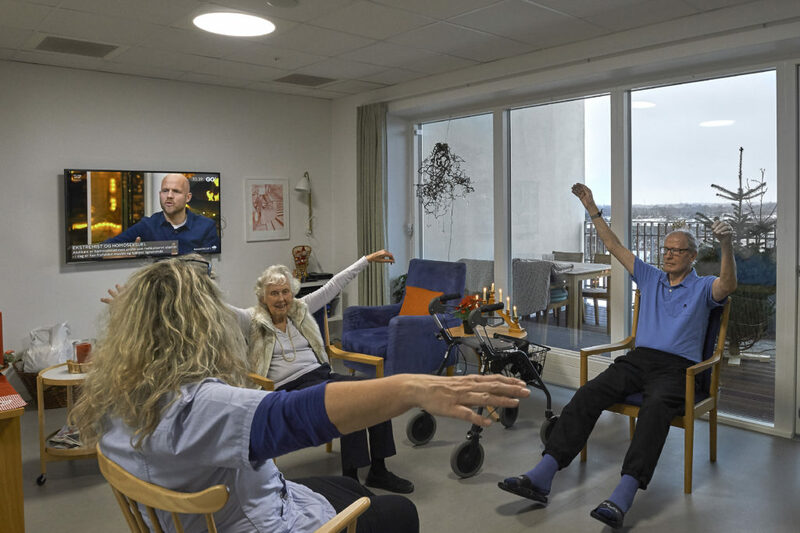 The applied circadian lighting has been designed by the Danish company Chromaviso to enhance circadian entrainment by use of electrical lighting so elderly and demented that stay indoor due to mobility and institutionalization will have proper circadian entrainment like people get with normal access to daylight. Since the photo transduction is not completely understood, the lighting design is imperatively explorative. However, all elements of it are based on proven relations between light and human or mammals and between human circadian rhythm and the light-dark cycle of daylight. The entrainment has two main components – Circadian phase and circadian strength. The first relates to the synchronization of the sleep/wake cycle of the elderly and the dark/light cycle of daylight. The latter relates to the amount of diurnal light exposed that leads to increase in sleep drive and immunity to circadian disruption by nocturnal light exposure. Lightel focuses on proving the benefits of using circadian adjusted LED lighting for housing for the elderly and specifically elderly with dementia. The next step is to find the optimal version of circadian lighting in order to maximise the beneficial impacts, aiming at a more personalised and profile-based circadian lighting. In such projects, the participation and the help of the staff is of great importance, and the right communication, presentation and goals of the project are really beneficial to this context. Secure more time for technology testing in terms of stability and integration in the existing building. Strong focus on implementation is very important, and preferably the elderly had time to get used to the new light before the test period. The project has a clear advantage in the fact that all tests and measurements are performed in the elderly people’s own home and not, for example, in a laboratory. But for that reason, the installations are not accessible for public access. You can schedule a visit with Kristina Aggergaard, the official contact person for the project. The Lightel project is a specific and documented business case in the municipality of Albertslund, but has the potential to transfer key elements and findings to other Danish municipalities. Every year, the municipality of Albertslund and DOLL Green Lab receive a great number of visitors from Danish municipalities and international delegations and companies, where the results are mediated, and it is possible to creates synergies.